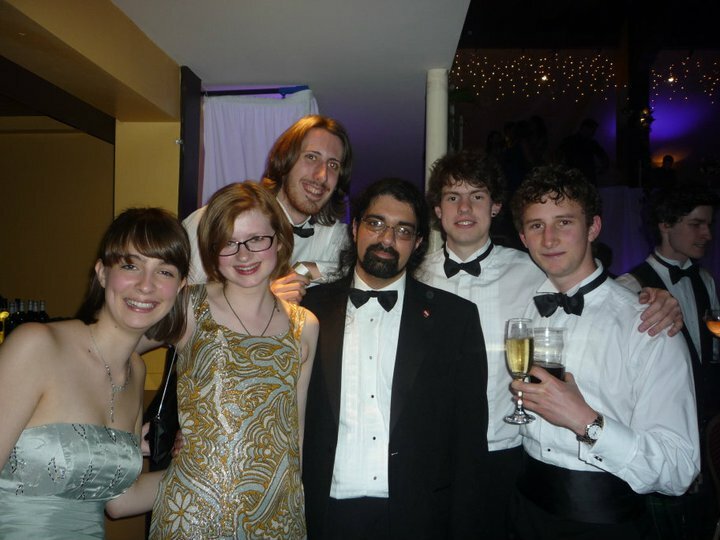 Posted by Fiona in Big things, Bwargh, Edinburgh, Law, Sheer bloody-mindedness, University. I’ve just gone onto Wikipedia, and found out the plot of Salman Rusdie’s The Satanic Verses. It was interesting. Of course, I’ve heard of the book before – who hasn’t? It’s practically synonymous with Rushdie’s name, with controversy, with all kinds of things – for the last few months, there’s been an exhibition about banned books at the National Library of Scotland, and I’ve gone round at least three times since August. The Satanic Verses was all over it, that and Lady Chatterley’s Lover. The last time I went round the exhibition, I went with my mother. “Do you know what it’s about?” She didn’t. She remembered the controversy, the protests, the fatwah, but she had no idea what the book was about, and neither did I. The exhibition wasn’t particularly enlightening on that front, although if I hadn’t known the plot of Lady Chatterley before I went in, I certainly did when I came out. On Saturday, I went to Leeds, to see DV8’s new performance, ‘Can We Talk About This?’ I had no idea what I was going in to see – I didn’t look it up in advance – but it was one of the most thought-provoking pieces of theatre I’ve ever seen. It’s based around interviews with all kinds of people, and has the basic premise of comment on how British attachment to multiculturalism means that it is failing to protect people who need to be protected. It focuses on radical Islam. There’s discussion of forced marriage, vigilantes, the murder or intimidation of writers and artists and film-makers accused of committing blasphemy, allegations of racism against people suggesting integration, or one law for everyone to abide by, or that Sharia might not be the right legal system for Britain. I don’t know where I sit about this: it was more partisan than I was expecting. I think I need to read more about it. And yes, there was a bit about Salman Rushdie, and The Satanic Verses, and how dreadfully controversial it was and how some people took it as a religious insult. And yet, until today, I had no idea what the plot of it was. Other things I have found out in the last month: the workings of an international arrest warrant, what Idi Amin did, the geographic whereabouts of the Central African Republic and Nicaragua, who was in charge in South Africa when they implemented Apartheid, and that there is no actual treaty giving explicit state immunity to national Foreign Ministers. Having said which, I still don’t think I’ll bother reading any Rushdie any time soon. Posted by Fiona in Edinburgh, Law, Sheer bloody-mindedness, University. It’s hard work, this LLM business. First of all, I have no lectures (well, one lecture, but the politics department are weird like that). It’s all two hour seminars, once a week for each of three subjects, the result of which is that I don’t have a lot of contact time, but what I do have is very intense, and requires I reckon in the region of 300 pages of reading for every seminar. Yes, you read that right. Come to think of it, chances are I probably didn’t. Read it right, that is. Sometimes it’s more, sometimes it’s less. Most of the time I do as much as I can without smoke coming out of my ears and call it a day. For the other modules, the law ones, I (nominally) know what they’re talking about, so it’s just a case of processing the ideas. Undergraduate law is child’s play. Well, it’s not. But it feels like it at the moment. I am getting through an ink cartridge every six days, on average. It’s taking me longer to get to sleep, because I have to shut the thought processes down, and longer to wake up in the morning, because I have to start them all back up again and these days it takes a few warm-up exercises. It’s very strange, to get to the grand old age of twenty-one and be very, very aware of your own intellectual limits, in the sense that at times, I feel like I can’t make my mind go any faster. I genuinely can’t figure concepts out in my own head fast enough to have time to process them, and that’s something I’ve never really dealt with before. Oh, but it’s such good fun, though. In the last five weeks, I’ve dredged the depths of GCSE History (League of Nations, self-determination, post-war social movements), Year Nine Geography (who knew half of these places were countries, never mind where they are and who they border! ), Politics-By-Osmosis (I spent an entire afternoon last week looking at Central African dictators in the 1970s on Wikipedia – which, by the way, is an absolute godsend – I really have no recollection of international current affairs pre-2006, which is a bit scary). It’s like the world’s biggest pub quiz has gone crashing into a newspaper archive, and expected you to have something useful to say out of the end of it. The remembering, and rediscovering things I used to know about, is just as much fun as the finding out new stuff. I love it to pieces. The trouble, then, is working out where to stop. Historically speaking, I am not very good at this. It is very difficult to put the brakes on. But I’m trying to remind myself that if I want to keep going, I have to pause occasionally. Sometimes your brain freezes up, or grinds to a halt and there’s nothing you can do, and you just have to accept that and take a break. So it’s taking a bit of practice, at the moment. We’ll see. 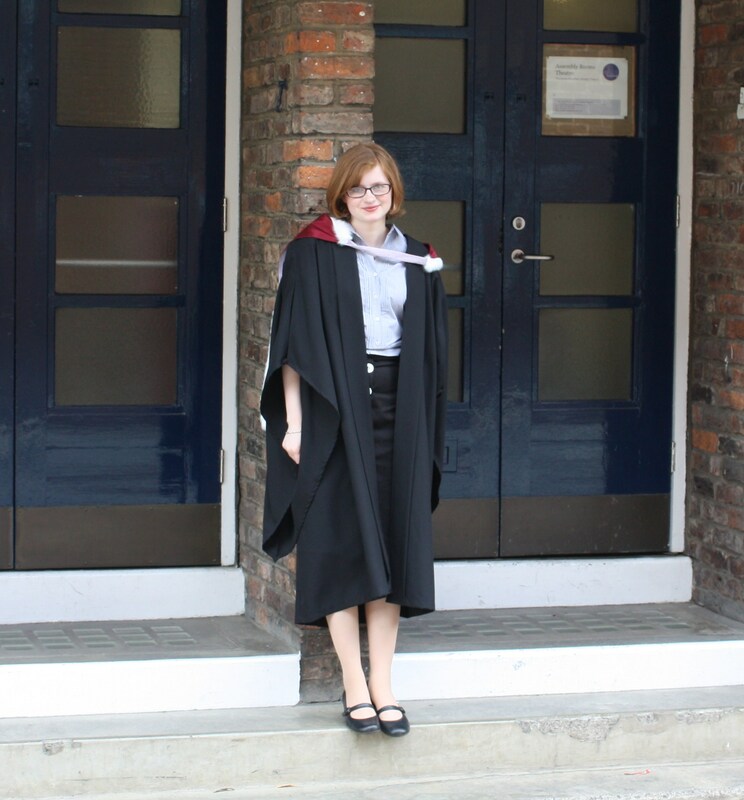 Posted by Fiona in Big things, Durham, Law, Look what I did, Lovely people, Really good day, Theatre, University. Graduation means movement. Colour graduates. Two days ago, so did I. My university experience involved a lot of sitting in libraries and accompanying backache. It involved a lot of coffee, and fruit tea, and late nights, and massive books. To begin with, I thought I’d read the massive books cover to cover and that’d be fine. I never did that once. I pulled more all-nighters than I care to mention. I blagged a lot. I slept in, and panicked, quite a few times. I came home at the end of every term and slept for several days straight, and I cried at eleven o’clock at night because I didn’t think I could keep going but I still had several hours’ work to do. I didn’t get a first in anything. Not once. I learned how to paint floors, and walls, quickly, and how to put up lights and hem tablecloths and take in clothes. I learned to knit jumpers. I made gallons of tea and cooked for fifteen with half an hour’s notice. I gave up my sofa, my living room, my entire house to other people, and I didn’t leave my bedroom for three days at a time. I got drunk with people I didn’t know and regretted it every time, but kept doing it anyway. Eventually I knew the people and I still regretted it. I walked on cobbles and down steep hills in 5″ stillettos, and had to be walked home at two in the morning in the snow. I ate rice for five days in a row, and spaghetti bolognese four times in the same week. I stayed up til the small hours, drinking blackcurrant squash and playing Lego Indiana Jones with seven or eight people crammed onto two sofas. When I graduated, I didn’t go to the law department. The law department is not representative of my university experience, even though I did a fair bit of law and I enjoyed what I did. 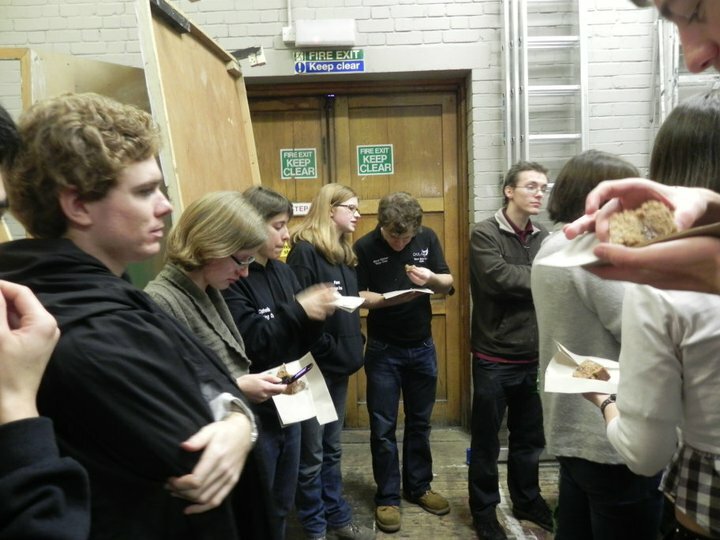 My university experience would not be summed up anywhere near my department. It’d be here, after working on a show with the other techies, all gathered round a table at the pub, dressed in black and grimy because we haven’t had time to shower for three or four days and so tired we’re all getting distracted by the lights on the slot machines. Or it’d be here, eating cake backstage and trying to avoid being one of the people who has to move the piano and surruptitiously keeping an eye on my props table. 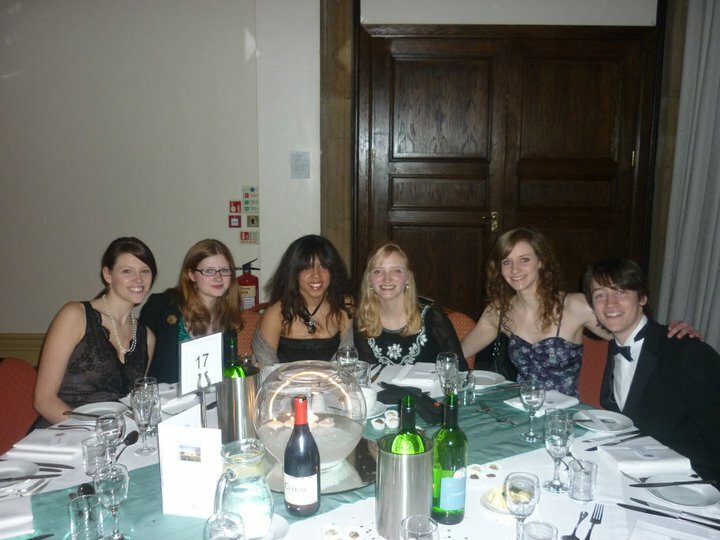 Or else it’d be at a college do, scrubbed up well and surrounded by friends, and smiles, and good conversation. I’ll miss Durham, and I’ll miss my degree, and I’ll miss spending hours browsing Westlaw and reading things just that bit off topic. But if something sums up the last few years, it won’t be the law department. If I had to pick a building, it’d have to be this one. Back home now. You’ll probably hear from me more often. Not that that’s in any way difficult. Posted by Fiona in Craftiness, Law, Sheer bloody-mindedness. It’s that point in term where my saturation of law is such that I’m blogging about it! This term, commercial contract law. Let’s talk about the terminology of selling things. This is something that’s come up in copyright discussions all over Ravelry for ever and ever, and it’s irritated me since almost that long. I’m going to talk about it in relation to the law of the sale of goods in England and Wales. I have no idea how similar or different it is in America, or anywhere else in the world, but I will say that the UK has a very well-respected, old legal system and that therefore the rules elsewhere in the world are probably similar-ish, and the terminology is almost certainly more or less the same. I say this because I know it’s true of a lot of criminal law and tort law, and so I assume it’s also true of some of commercial and contract law. When you sell something, for example a car, according to the law, you’re not selling a car. You’re selling rights with regard to the car, or ‘interests’ in the car: that is, the right to take possession of the car, the right to use it however you like, the right to say who can use it and who can’t, the right to take all the profit if you decide to sell it on. If you sell me the car, what you’re doing is selling me all the interests in the car, and all the interests put together are called ‘property’ in the world of commercial law. Now, obviously, if what you’re selling to me is the pdf of a knitting pattern, you’re not giving me all the rights to the pattern. I can’t take credit for the pattern, I can’t sell it on as if it were my own. But, under UK commercial law, and the commercial laws of countless other nations, you don’t have to sell me all the interests to the pattern just by taking my £3.50 and sending me a pdf file. What is usually being sold is not the pattern, but a license to use the pattern. Use of the pattern, you’ll notice, is an interest in the pattern. It is but one interest. Right to reproduce the pattern, that’s another interest. Right to sell the pattern on, that’s another interest too. None of these interests are necessarily inherent in me getting my hands on a copy of your pattern. Those rights belong to the designer automatically, as do all of the rights, because they’re part of the property of the designer. So if I particularly want to reproduce my copy of your pattern, I can only do that if you’ve sold it to me. The difficulty here arises when designers don’t state in advance, “If you buy this pattern from me, you are buying a license to do x, y, and z. You are not buying a license to do a, b, and c, and you may not do these without my permission.” So a lot of the problem with the law with regard to this comes from the question, what rights do we assume the ‘standard’ license to contain? In other words, if it’s not made explicit in a contract, what can we imply are the license’s terms? Everyone has different views on this, and I’m not going to offer mine because I’m scared the Copywrong Police will come and eat my brains. The other thing that comes up and annoys me is the speed of people to say that they don’t need to honour license agreements, even informal or implied ones, because if it got to court it wouldn’t be upheld. You’ll notice the enforcement of licenses of knitting patterns is not a hot topic in the legal world right about now, and that is because they basically never get as far as court. You can say that this is because knitters and crocheters are all lovely and like keeping their goodwill and all that, but the fact is that out of all contracts, very, very few get as far as the courts. That’s because contract law is not about who would win in front of a judge. Contract law is about making people feel more confident about entering into agreements, so that more agreements are made, and things get done. It’s also largely about creating avenues that the parties can go down to sort their disputes out without having to go up in front of an elderly man in a silly wig and talk about how someone stole their instructions for a scarf. Just because something might not necessarily be enforceable in court – and I’ve no idea if these things would be, this is a flight of conjecture already – that doesn’t mean you shouldn’t do it. Equally it doesn’t mean that contract law isn’t working with regard to it, and it doesn’t mean nobody is bound by anything. Being bound does not equal having a remedy. The law still sets a fair bit of store by good faith: it’s still a principle of the courts in the UK at least that you’ll do better if you approach the court with clean hands. I think that’s about right, anyway. 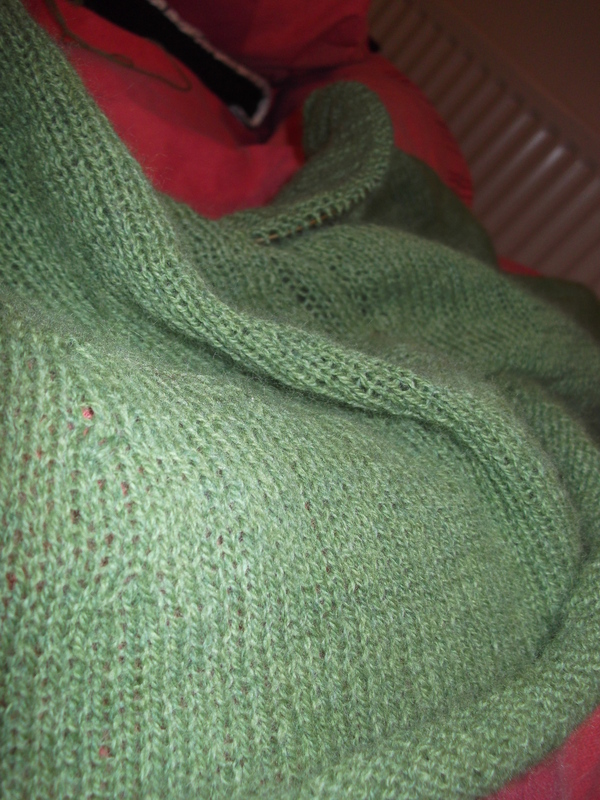 If you’re on Ravelry, you’ll see that I’ve taken lots of pictures of jumpers and things. Prepare to be bombarded with them here in the next day or two. Also, Lent starts tomorrow. I’m giving up buying yarn and casting on new things, with the two parameters that the second in a pair of socks doesn’t count as a new thing, nor does it if I rip something back and completely start the same item again. I’m looking forward to getting a few things finished. Posted by Fiona in Big things, Breaking the fourth wall, Craftiness, Durham, Knitting, Law, Sheer bloody-mindedness, University. The first draft of my dissertation was handed in about 11 o’clock at night on Friday, which was the deadline. In the last week, I’ve seen closing time in two different libraries, and opening time in one of them. I haven’t really had much of a week, frankly – it all seemed to disappear in front of a computer screen. I’ve slept twelve hours the last two nights, so that should tell you something. 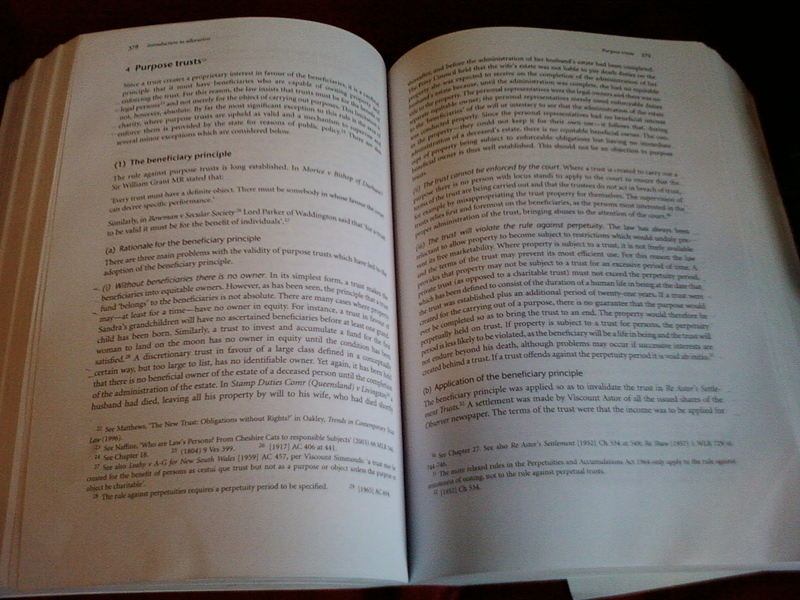 The paper is mammoth, though – twenty-five pages plus bibliography. Aside from NaNoWriMo, I’ve never written anything that big in my life. It’s kind of a big deal. I keep rolling the words undergraduate dissertation around in my head, and they don’t sound any less grand than they did this time two years ago. Grief. This is SOMETHING I FINISHED!! I actually have two knitted tops that I’ve finished in about the last six weeks – not because I’ve been knitting so fast my hands are on fire, but because I am a lazy sod who hates sewing things up, so when I do sew things up, it tends to be all in one go. 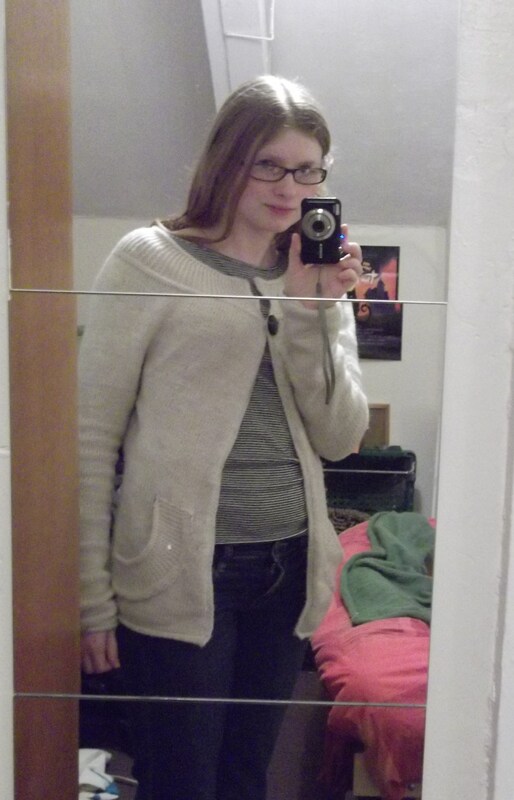 The cardigan in the picture is Harvest Moon (Rav link) by Heidi Kirrmaier. I started it on Christmas Day to make up for all that knitting for everyone else, and it waited for about a month for me to sew the pockets on, and another month for me to block it. And I adore it. And it’s alpaca so it’s the warmest thing in the world. And it sheds cream coloured alpaca all over my black brushed wool coat. If it didn’t do that, I’d never take it off. I love this yarn very, very much. It came on Friday, the day I handed my draft in, and my reward for finishing said draft was to cast on the Sock Knitters Anonymous group on Ravelry’s March Mystery Sock. The theme for this month is lace, and the mystery sock is gorgeous. I finished the first clue today, and it reminded me how much I love just blindly following patterns occasionally. You don’t have to worry about how it’s going to turn out, you don’t have to keep in mind what amendments you might want to make, you can just take the instructions and run with them. It makes me happy. The yarn is Juno Fibre Arts Buffy Sock, and it’s a superwash BFL, and I love it. I haven’t knit with Blue Faced Leicester in far too long – I’d forgotten how much it practically glows. This stuff is so much fun to work with. 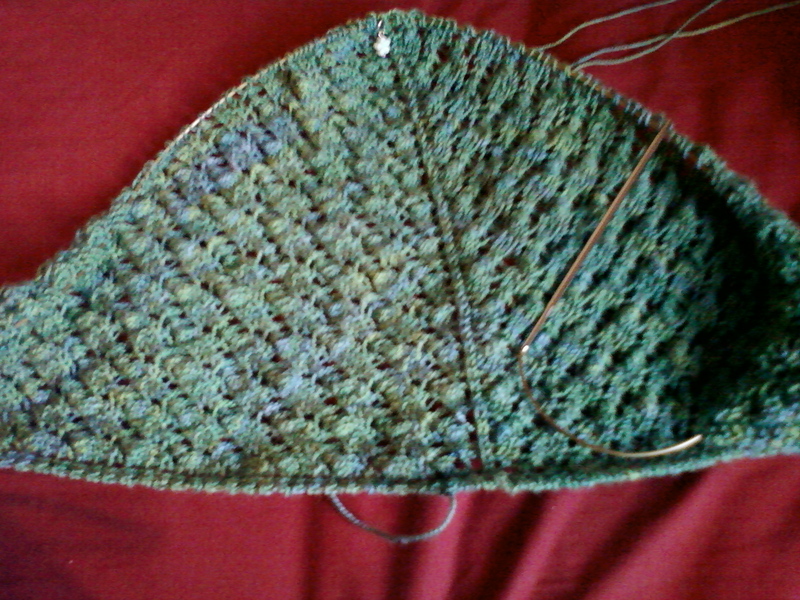 So that’s what’s happening knitting-wise at the moment, for the most part. As for the rest of this blog, I’m afraid you’re rather going to have to bear with me at the moment. You’ve probably noticed it’s been a bit thin on the ground, of late. This year is not an easy year, it’s my final year as an undergraduate, and at the moment I feel a bit like I’m treading water. Of course I’ll do my best to keep going – I love this blog, and when I’m able to do things with it, I love it and I love hearing your feedback and comments. But if they’re sparse for the next four or five months, please do hang on. Normal service will be resumed when I’m not up to my ears in the All England Law Reports and for now, well, I like you lot. So I hope you’ll hang around. Posted by Fiona in Durham, Law, University. Disney got it wrong. It’s not cute, it’s not special, and all girls don’t secretly want it. Embedding’s disabled, but I do recommend you watch this and, if you’re anything like me, tape your own reaction. I’m taking this as a badge of honour, myself. I had a lecture recently on the conflict in Kosovo – isn’t it amazing how when you’re a certain age everything slides past you? I’ve known for years that when I was fourteen or fifteen I had no idea what was going on in the world, but the fact that the Kosovan declaration of independence was signed in February 2008? Where on earth was I? During the second term of my second year of A levels, I read the newspapers religiously. How did I not have any idea that one of the biggest international political events since the Second World War was going on under my nose? This scares me a little, and I wonder how much is passing me by right this minute. As for the lecture, though, it was the most interesting and stimulating subject I have come across possibly in my entire three years of studying Law – and I don’t use that lightly, there are a fair few things I’ve found interesting practically to the point of obsession. I had a tutorial on how to define a state the other day. International public law has rather grabbed me round the throat this term. I wonder, again, if I’m trying to do the wrong thing with my life. Oh, and I’m learning French. That’s exciting. That’s happening. And I ought to be working and I’m not, and my current knitting project is Christmas-related, just like the other two, and suddenly I’m desperate to knit something for myself and I can’t until I’ve finished these. Which is not to say that they’re not fun, and probably that they’re a metaphor for my failure to cross anything off the right end of my to do list at the moment. 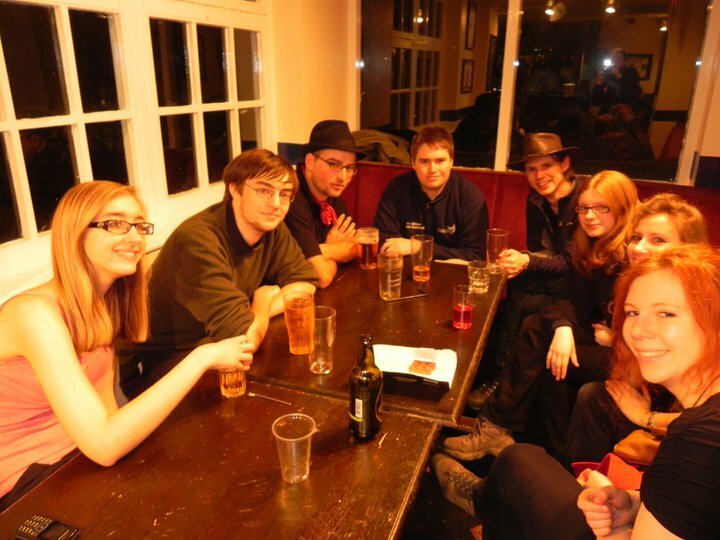 Posted by Fiona in Big things, Durham, Law, Lovely people, Theatre, Uncategorized, University. It has been said among law students that, in an essay or paper marked out of 20, only God can get 20 marks. His angels and archangels can get a maximum of 19, the lecturer’s lecturer can get 18, and the lecturer himself can get 17, so the best a student can ever hope for is 16 marks. Got my results back today. They’re not sparkling and wonderful. They’re not even particularly great. I probably couldn’t get an overly spectacular job with them (yet) but hell, they’re so much better than last year that I can’t bring myself to be disappointed. I’ve scraped a 2:1 (if you round up by 0.3%, which of course I do) and because of what I got last year, and what I was honestly expecting based on how I think the exams went… I’m just unbelievably relieved not to have to resit anything in August. I couldn’t be happier. It’s odd, I’ve always been the girl who looks for A*s, who vies for a spot in the top three of a class. Now I’m just happy to have scraped an average. Anyway, I improved by nine percent this year, so it’s onwards and upwards, I suppose. The last few weeks have been very busy: college ball, the D’Oscars (student theatre awards), A Chorus Line rehearsals 9 til 8 most days and then, of course, last week was production week! Oh yeah. And the mirrors. Well they seemed like a very good idea until they actually got to the theatre. Do not get me started on those mirrors. But of course, you can’t do A Chorus Line without the mirrors, and they looked very good even if they were a royal pain in the proverbial. Luckily, though, Lawyerly Housemate was the stage manager, which meant that they were in the best possible hands – although neither they nor we escaped without injury – and most importantly those best hands weren’t mine. Joy! I went to see His Nibs for a few days, which was a breath of fresh air. I’ve been stuck in Durham for too long. We drank coffee and went charity shopping and cuddled because it’s not been an easy, or a comforting term for either of us. I spent a fortune on dresses and impractical shoes, and finished a shawl, of which I hope there will be pictures shortly. 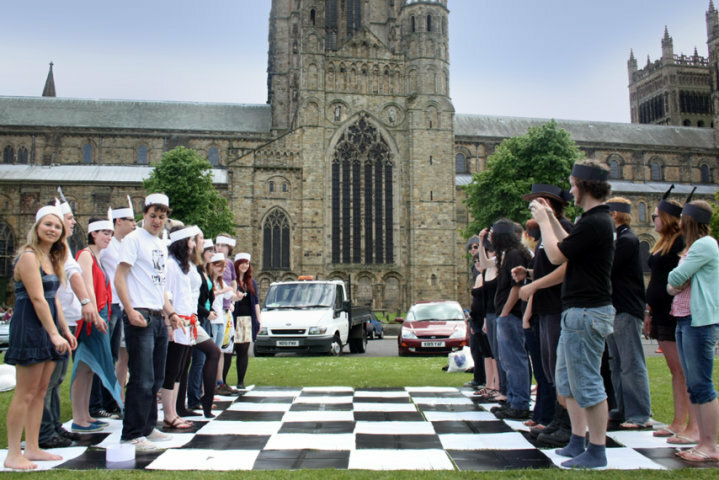 …Durham University Giant Chess Society. How would I sum up my experience of Durham in one picture? Probably something like this. Silly hats and all. Still, I’m tired now, and I’m missing home. The end of term is full of people and very late nights, and while I am generally a great fan of both, it is all a matter of extent. I’m planning to check out the new yarn shop in York (where Sheepish was) on Friday, and, of course, Duttons, under the pretense of a visit to see Captain Shakespeare and his new theatrical endeavours. (Oh yes, and there shall be ogling of his theatre also, no doubt!) It’s only going to be me, depending on when CS can get away from preparations (law of the universe: expect nothing from anyone involved in the theatre twenty-four hours either side of opening night) but you know… I might just dress up.